Several hundred supporters enthusiastically greeted Republican presidential candidate Texas Sen. Ted Cruz at a town hall rally Monday at the American Legion in Towson, Maryland. The senator’s visit coincides with Maryland’s April 26 presidential primary. A decisive victory could help Cruz slow down front-runner Donald Trump’s momentum. But if polls are any indication, he has no shot. He might have been able to count his votes among the hundreds who showed up to hear him speak. Cruz is in third place with 19 percent of the state’s potential primary voters while Trump is leading in Maryland with 47 percent, according to a recent Monmouth University poll. That same poll puts Ohio Gov. John Kasich in second place with 27 percent. It’s not surprising Cruz is courting voters in Maryland while Trump remains in New York prior to Tuesday’s Big Apple primary. The real estate billionaire was doing his stump speech in Buffalo Monday while the Cruz train left the Big Apple, where he was booed on the streets for his immigration policies and his dislike of New York values. The latest poll from Real Clear Politics shows Cruz sinking to third place while Trump is blowing away the field. Former presidential candidate Carly Fiorina introduced Cruz to the Maryland crowd. Fiorina described the Texas senator as a “constitutional conservative,” with a proven record of taking on the status quo in Washington. Fiorina also said Trump’s self-described anti-establishment credentials are illegitimate and compared the real estate mogul to Democratic frontrunner Hillary Clinton. Following Fiorina’s speech, the senator’s supporters watched a short campaign video and then Cruz took the stage. On jobs, Cruz said Obamacare was partly to blame for underemployment. “I want to take a minute to talk to all the single moms who are here, who are working two and three part-time jobs, who have had your hours forcibly reduced to 28-29 hours a week because Obamacare kicks in at 30 hours a week,” Cruz said. 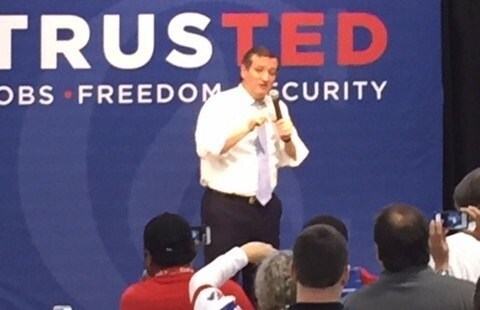 Cruz also discussed taxes, foreign policy and constitutional protections. Fiona Moody, who is a 23-year-old teacher and campaign volunteer, told the Baltimore Post-Examiner she is supporting Cruz because his values closely align with her own. Kyle Casey, a 21-year-old student at Towson University and former Rubio supporter, told the Post-Examiner he will most likely support Cruz and that he decided to attend the rally because it presented a unique opportunity. “It’s a once in a lifetime opportunity,” Casey said. Former Frederick County Commissioner Paul Smith, 65, told the Post-Examiner that while he is not opposed to Trump’s candidacy, he said Cruz would be a better nominee. “He’s the best Republican hope for president,” Smith said. Smith expressed dismay with some of Trump’s antics and said that since the real estate mogul “continues to offend and alienate people,” his chances of winning a general election are gradually diminishing. Other speakers included state senator Michael Hough, (R-Frederick) and former two-time GOP gubernatorial candidate Ambassador Ellen Sauerbrey. I hear he is the ONLY one that can win!! BUHAHHAHHAHHAHHAA!!!! !